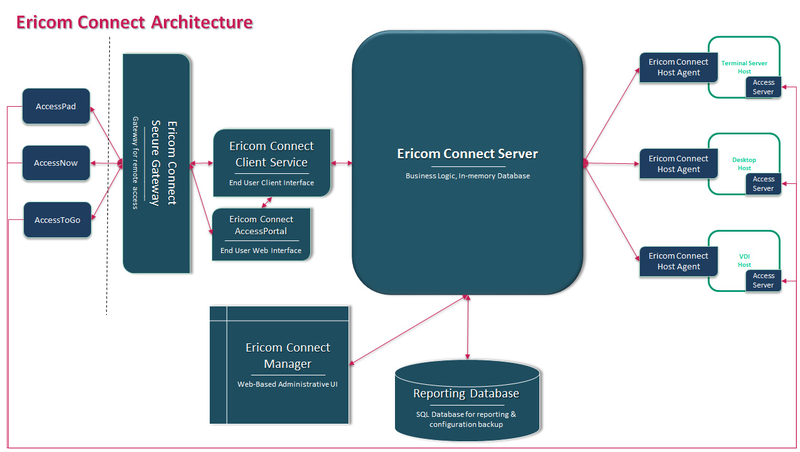 Ericom Connect is a powerful remote application and desktop access solution. Built on innovative technology and two decades of Ericom's proven expertise in the access market, Ericom Connect offers enterprise-level organizations unparalleled scalability, superior user experience and exceptional ease of use. With great cost performance, Ericom Connect integrates into existing IT environments, reducing the need for costly infrastructure upgrades. Combining the benefits of advanced Grid technology and robust connection brokering, the cloud-ready Ericom Connect offers high availability, super-scalability and enhanced performance. 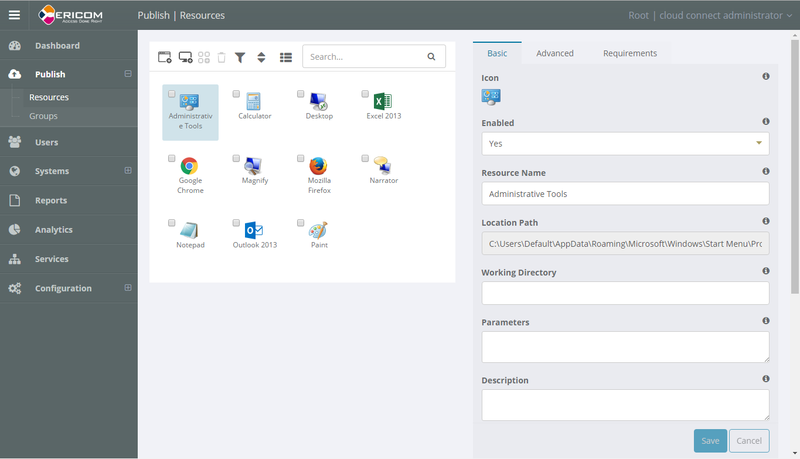 Admin Console: new field in RAWS configuration "Custom Address". Upgraded Ericom grid for improved performance. Reports: Added "Named Users Current/Previous month"
Clarification: Azure Application Gateway support is only available for AccessPortal/AccessNow (web-based) interface. Admin Tool: The "Host Not Running Action" has been added to non-VDI host groups. When screen mode is 'Normal' and set to a’0’ an error will be displayed. ConnectCLI: Can use '^' as a line continuation character - if the last character on the line is '^', the following line is concatenated. ConnectCLI: ‘userActiveDirectoryInfo’ added /terse to suppress the output of the user's group memberships and attributes. ConnectCLI: Command-line (ConnectCLI>) 256-character limit is removed. NOTE: This version is NOT backwards compatible with Blaze version 2.x and AccessToGo version 2.x. Parameter Encryption. Ability to pass multiple settings using a single, encoded parameter. NOTE: This version is NOT backwards compatible with AccessNow version 2.x. Session resize. AccessNow session will automatically resize to fit the browser window after a windows resize or orientation change. Major performance enhancements. Major performance enhancements over previous versions including improved video and audio support. Access Server. The AccessNow Server is now called Access Server. It is a unified server serving AccessNow and Blaze clients. 64 Bit & 32 Bit versions. Access Server is available in 64 Bit & 32 Bit versions to make best use of system resources. Time zone Redirection. Default support for using client time zone within sessions. (Can be turned off based on configuration). Windows SSL. Access Server now uses standard Windows SSL for improved stability and performance. RDP redirection. AccessNow supports RDP redirection for environments making use of RDP farms. UI Customizations. Hide Windows login/logoff screens when accessing published applications. Change background color during AccessNow login. Customize Printer Name. Customize the printer name that appears within AccessNow. Ignore URL parameters. Configure AccessNow to ignore URL parameters for tighter security. Localization Support The AccessNow UI can now be displayed in languages other than English, including Japanese and Chinese. The default display language is set based on the default browser language. Japanese and Korean keyboard layouts are now also supported. Audio Support for iOS6 and Android. Touch Support for IE10 (Surface, Windows Phone 8 and Ultrabooks). Note that pinch to zoom and panning isn't supported. SSL certificates via the AccessNow Configuration Tool. Support for mobile devices – both smartphone and tablets, such as iPad, iPhone, RIM Playbook, etc. Clipboard support – copy and paste between remote session and local applications. Full support for Chromebook keyboard, including hot keys for extended features such as function keys. Full support for Windows XP as remote (RDP) host. Support for latest versions of Chrome, Safari, FireFox, Opera and Microsoft IE10 Beta. Supports RSA SecurID for two-factor authentication (for VMware View). New Access Server and licensing configuration utility. Improved performance and reduced resource utilization. Secure Gateway can function as an HTTP proxy for VMware View server and IIS. Secure Gateway can be used as standalone web server for AccessNow. Enhanced configurability of AN: hidden fields, remember password, etc. AccessNow client logging for improved customer support. Incoming RDP connections enabled on the OS. 20 MB of free Hard-Disk space. MMX and SSE2 capable CPU. Firewalls are configured to allow traffic over the AccessNow port. When connecting using secure WebSockets or HTTPS, always install a proper certificate on the server-side (Ericom SecureGateway or Access Server). When the AccessNow client is delivered using HTTPS, always connect using secure WebSockets or through the ESG. With Ericom Connect, we have taken an entirely new approach to the world of connection brokering - in terms of scalability, ease of deployment, redundancy, and basically everything related to access for enterprise-level organizations as well as SMBs. The scalability, alone, reaches new industry heights - you can start out as small as you want, and grow to one million users and more. In the same way that the system is incredibly easy to set up, configure and use, Connect is extremely efficient & effective, requiring minimal resources in terms of servers & administration. The unique real-time reporting & alerting capabilities enable you to easily see How many people are on the system, Where they are accessing it from, and What resources they are using. And with built-in fault tolerance, no third party solutions needed and no single point of failure. With built-in clustering, if one server fails, the system keeps running. How long does it take to install & configure Ericom Connect? A typical installation takes about one hour. As most of our technology is built into the central EricomConnect Server, it's very easy to set up and configure the system. As a System Administrator, one of the first things you want to know is, Is my system up and running? Is everything OK? Connect's fully Web-based UI gives you a high level, immediate view of the health of your system. All the technical things you would want to control in a remote session are available right here on the screen. 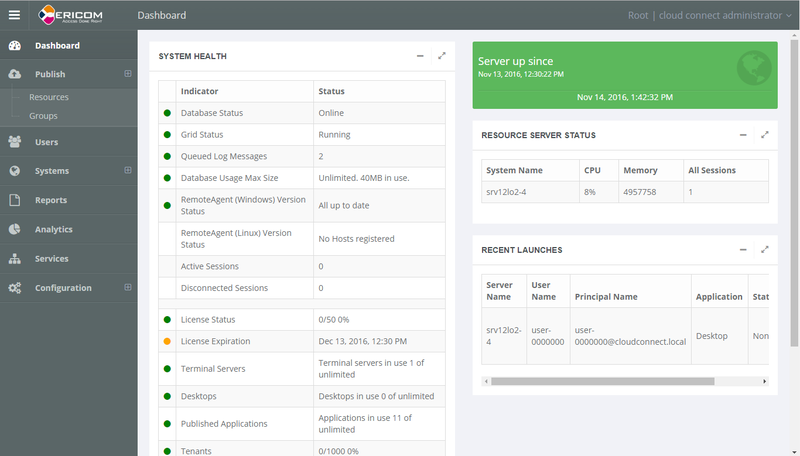 The system admin can even see a simulation of the end-user experience, that is, what resources a particular end-user would see if they logged on. For debugging, finding issues, and more, this unique & remarkable tool enables the system admin to visualize what a user is going to see when he / she logs into the system. You can also gain deep insight into how the system would provide the end-user with resources, what server the end-user would connect to, and all the settings that would be associated with that session. A tool that offers this type of power and knowledge does not exist in any other environment. How Scalable is Ericom Connect? Hyper-Scalability - Connect is able to scale to unparalleled proportions. It is also inherently reliable and always available. The flexible scalability of Ericom Connect makes it an ideal solution for SMBs to larger enterprises across all industries. Let's say you have 50,000 users on a single server and you're merging with another company and need to add another 50,000. No problem: Just add a second server into the Grid; it automatically expands; now scaling to support as many users as one needs. Uniquely built on advanced Grid technology and robust connection brokering, a single Connect server can support per up to 100,000 users and more. For a multi data-center installation, system admins can centrally manage a single installation across multiple data centers (e.g., installing 10 servers in completely new sites across the globe). The sys admin can also manage group policies instead of individual resources, such as in a hospital environment, for example: Groups of resources, Groups of servers they sit on and Groups of end-users with access to those systems. Similarly, he / she can define the relationship between all those various groups, as well as the characteristics and the security features around them. All this makes it very powerful and easy for an administrator to manage hundreds, if not thousands, of resources and users on a single interface! Define desktops and applications to be accessed. Define Host groups Define user level access per resource group. Configure session details and characteristics. Configure group session details and characteristics. Configure user level session details and characteristics. Which Edition Do I Need? Easy-to-use, web-based administration allows executive & technical staff to control who has access to what, while making sure everyone has access to the parts of the systems, resources and business tools they need in order to do their job on a daily basis.. This allows the IT Administrator to publish Windows applications and desktops as well as Linux desktops, customize the user environment, manage group policies, configure and monitor resource access, closely monitor user behavior and easily identify intruders. Additionally, customizable, delegated administration allows IT to assign rights and privileges to a variety of users in accordance with security profiles and organizational hierarchy, easily and efficiently. Multi-language support for the Administration Console, includes Asian and other languages. Leverage one scalable installation (rather than installing several disparate silos) to deploy multiple private Ericom Connect tenant environments. One installation reduces IT overhead, configuration, and maintenance. Each tenant environment receives a dedicated URL and can manage isolated environments based on line of business, geographical locations, etc. End users may use several Ericom portal interfaces to sign in to Ericom Connect and launch published resources. AccessPortal - modernized web-based portal, which provides HTML5 browser-based access. AccessPad - a native client that displays applications or desktops using server-side configuration settings. This client supports Ericom Blaze acceleration and non-accelerated mode. AccessToGo - a native mobile application for iOS and Android operating systems. Provides enterprise-level security measures with comprehensive security features, including real-time intruder monitoring, logging and event recording, Single Sign-On and Kerberos. For an additional layer of security, Ericom Connect integrates with leading SSL VPNs and RADIUS, RSA® SecurID®, SecurEnvoy®SecureAccess and SecurICE two-factor authentication support within Connect's Windows native client, as well as with special proprietary customer security systems. Additionally, built-in support for SSL / TLS 1.2, enables all connections from the client to the Terminal Servers to be encrypted, making them secure across public networks; other SBC solutions offer a secure server specifically as a stand-alone server only. Moreover, with built in SSL / TLS 1.2 administrators can permit secure connections to servers that do not support SSL connections. Ericom bundles UniPrint, RDS-based leading printing solution, as part of its product installation and end-user software client. Additionally, Ericom provides the option to integrate with other leading universal printing solutions (e.g., triCerat, Net2Printer and others). Ericom Connect integrates with Microsoft's Active Directory for user authentication. If the network user is disabled, then the Connect server will not allow this user to log into the system. The Ericom Team client allows multiple users to view and collaborate on files via a single remote session; perfect for remote learning and team projects. Each participant can take control of the live session when they have something to contribute, while others can view the ongoing session in real time. End users are seamlessly authenticated into their hosted applications using standard SSO protocols (SAML or oAuth). Ericom vs Citrix: Key Differentiators - Ericom provides the same key security, reliability, performance, and mobility benefits that Citrix offers - more simply and at a price that more organizations can afford. See how the two solutions stack up.